The “Save the dates” are starting to arrive and, right on cue so is the anxiety. OK, the person who really has the sartorial stress on a wedding day is the bride, but spare a thought for us poor guests. Indian weddings can be tough and demanding. It’s no more a union of two souls, but an excuse for two big families to throw a big fat party. And I am not complaining. 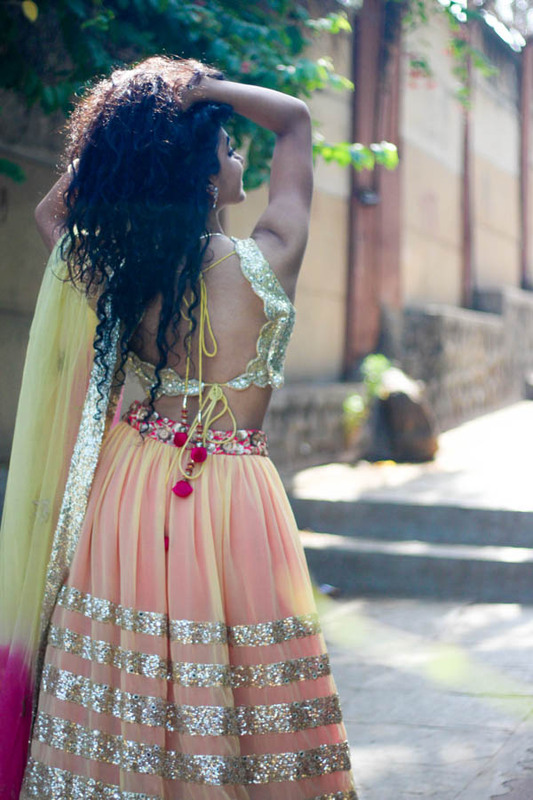 I love every bit about Indian Weddings. But while it’s easier for the families of the bride and the groom to figure what to wear for the wedding, it’s difficult on the part of the guests to decide what to wear. 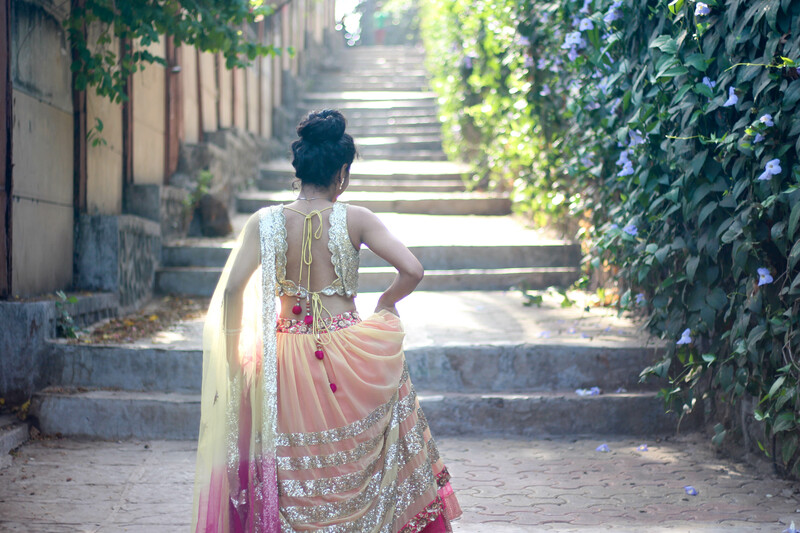 We have to decide what to wear from Mehendi to Sangeet to the Actual Wedding to Reception. The struggle is real. While deciding all this, many questions come to our mind like, How much bling is too much? How subtle is too subtle? Should I color co-ordinate? And so on. Buying wedding outfits definitely burns a hole in our pockets. Personally, I really don’t end up buying party clothes, I hardly have something to wear for functions because I don’t like spending on such statement pieces that I’m only going to wear once unless and until it’s for my birthday! Haha. I don’t think it’s worth it to spend thousands of rupees on an outfit which I’ll wear for 3 hours. But hey, we’ve got Flyrobe to save the day now, don’t we? In case you’re unaware of what Flyrobe does, read my last post here. They have a wide range of western to ethnic collection. 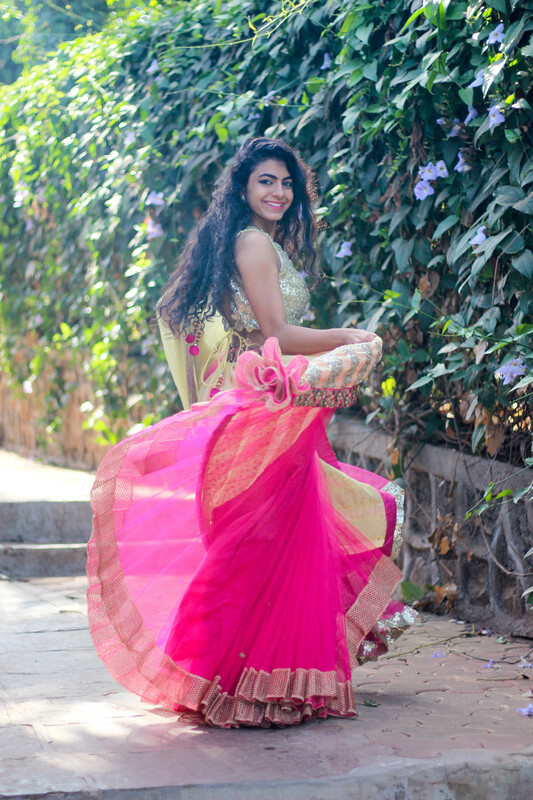 From Dresses to Gowns to Dhoti Sets to Sarees they have it all. 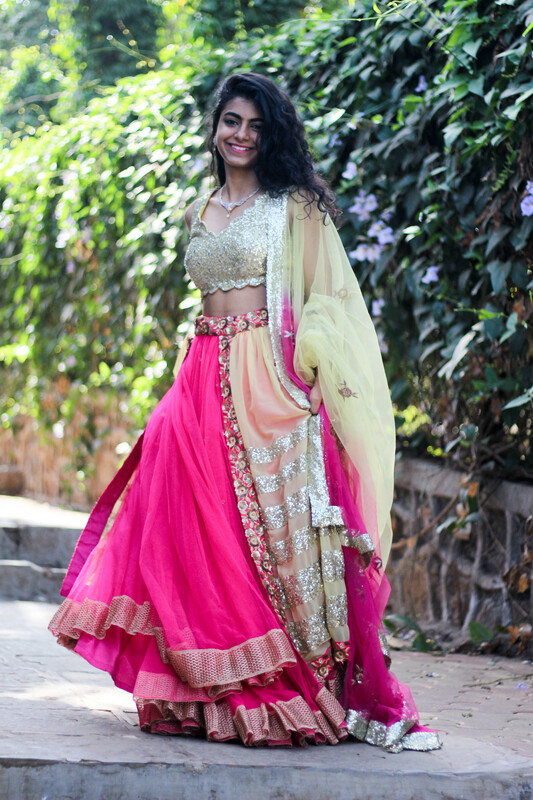 Amazing designer labels like Aharin, Samant Chauhan, Valliyan, Outhouse, etc are available on their website which makes it so difficult to select just one outfit from their wide range of outfits. 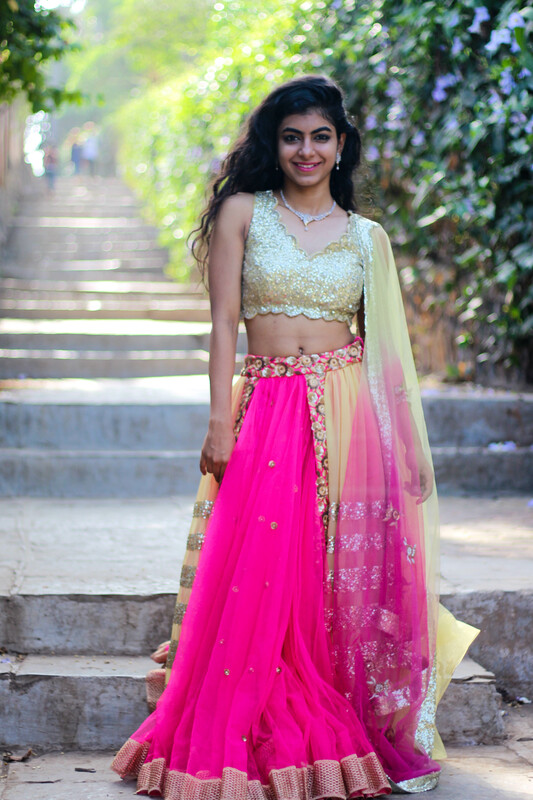 After liking a lot of outfits, I finally chose this beautiful sleeveless shimmer blouse paired with a peach and pink net lehenga and a shaded net dupatta edged with shimmery borders. I love how elegant and classy it looks. I’d never have imagined being comfortable with the idea of renting an ensemble, but Flyrobe is clearly making me rethink that. 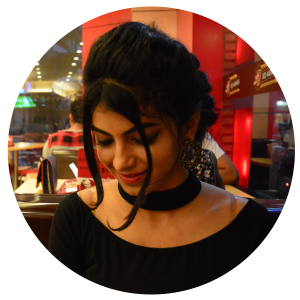 Rent any outfit with the click of a button, and find it at your doorstep within 3 hours! Flyrobe is my fix for all occasions, what about yours?